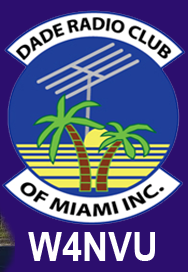 November 2012 Meeting MInutes – W4NVU – Dade Radio Club of Miami Inc.
Meeting was called to order at 19:31 with 28 present. We have a quorum. Miguel presided over the meeting and welcomed everyone. The meeting was not broadcast live on the air tonight from the EOC. There was no testing tonight. Everyone took turns and stated their name and call sign. Miguel welcomed everyone again. Miguel reminded everyone present tonight to sign in. He stated that if anyone new has a question, just ask. We will get you in the right direction. Miguel asked all of the veterans to stand up and be recognized. A big thank you to all of them! Miguel announced that our Holiday Party will be our meeting night, December 10 at Carino’s Italian Restaurant at 8240 NW 36 Street, Doral, FL. It starts at 7 PM and it costs $25.00 per person. Make your reservations with Esther so that we have a list of who is coming. The minutes will be posted and approved. Corresponding Secretary – We do not have one. Merritt did pick up the mail but is not here tonight. Treasurer’s Report – Esther stated that we have 5 members that have paid their dues so far for next year. The dues are $30.00 per member and an additional $5.00 for family members. Please see Esther to pay your dues for 2013. The Holiday Dinner is $25.00. See Ester tonight. Miguel stated that the cut off is December for the 5013C. Frank recommended an accountant for the 5013C and he will give the information to Esther. Esther stated that we renewed our insurance in May. Website/Newsletter – Ryan advised that it is up and running. If you have anything to add to the website, let Ryan know. Lenny spoke about how the FCC wants to reduce the number of VE’s from 3 to 2. He is asking us to support leaving it at 3. Philipe stated that each individual should send their vote individually to the FCC. 147.000 – The comptroller was purchased. Merritt has all the parts. He has already put the repeater in the box. Hopefully it will be up and running in the next couple of months. 147.760 – Ray is out tonight but it is up and running. 444.200 – up and running. Digipeater 144.390 – is working. The Miami-Dade Ares/Races nets were discussed. Our numbers are up for check-ins. Coral Gables net info was given, as well as for the Everglades Rag chew. We will use 28.400 on AM for 10 meters on the HF net. D’Star – Miguel states that this is a repeater donated by Communication City/Icom. Dave announced that a location has been found. It will be 28 stories in Aventura. We have the approval of the architectural committee at the Condo building. They are waiting for Board approval. They will be meeting in the next 14 days. Frank is ready to install as soon as it is approved. Miguel again spoke about the Holiday Party. It’s $25.00 per person at 7:00 PM at Carino’s. Please see Esther. You can also go online and pay. Armando spoke about the next set of Tech classes. We are going to hold off until next year. We also need a location for a study sessions for the General test. It will be 2 Saturdays from 8:00 AM to Noon. We need to find a facility in the area so that we can get as many operators to take the General test before the Hamfest. Miguel brought up the Elks Club on Sunset. It was also suggested that we look into schools that provide night classes where we might be able to use a room. Hamfest was discussed. February 1 and 2, 2013. Miguel has received a lot of calls and emails for tables. The big 3 are still holding out. Please take flyers with you tonight and put them everywhere. Miguel has 10,000 tickets. If you want to sell tickets, see Miguel. There is a Hamfest meeting tomorrow night here at the EOC at 7 PM. Everglades Radio Club is holding their Annual National Park Opening the first weekend in December. It is the same day as the Tampa Hamfest. Miguel said that they still have a few openings that need to be filled. If you are interested, see Miguel. Philipe announced that UM’s free flea is this weekend, Saturday, at the engineering parking lot. Miguel announced that our club is going to talk to Rick Ruhl tonight via Skype for a presentation on Ham Radio Deluxe (HRD). Due to technical problems, we were unable to connect with him via Skype. Miguel thanked everyone for coming. A Motion to close the meeting was made by Robert, seconded by Frank. Voted and passed. The DRC meeting was adjourned at 20:18.